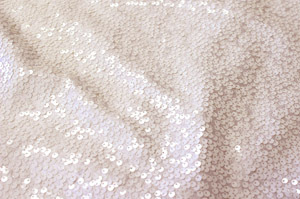 Order the best Quality Taffeta Sequins Table Drapes in beautiful Cream Color. Fabric Description: A critical fabric in the event industry. Taffeta is an embroidered sewn on approximate 3mm sequins dangling off a solid taffeta background. Underlay is not recommended for tablecloth usage. Great for Tablecloths, linens, overlays, runners, Chair Caps, Chair Jackets, and decoration purposes. Great for dresses in the apparel industry. Fabric Weight: Medium to Heavy weight with a very soft hand feel. Great for tablecloths.